Contrary to the holiday song’s assertion, spring is the most wonderful time of the year. I picked the first ripe tomatoes last weekend, along with the first of what promises to be an onslaught of zucchini. Herbs–oregano, dill, cilantro, four kinds of mint, garlic chives, tarragon, lemon balm, fennel, holy basil, lettuce-leaf basil–grow in abundance, plus peppers and green onions. At this time of year, who needs a grocery store? In spring, dinner is as close at the backyard. I sliced the very first 2012 tomato and layered it with whole-milk mozzarella, a few basil leaves, and a drizzle of balsamic vinegar, olive oil, black pepper, and a few grains of sea salt. The first bite proved once again that nothing beats a fresh, homegrown tomato. It’s not too late to start a warm-weather garden in south Louisiana. If you have a very sunny spot in your yard, loosen the dirt a bit and stick in a couple of tomato and pepper transplants. The best tasting tomato is waiting for you to plant it…. 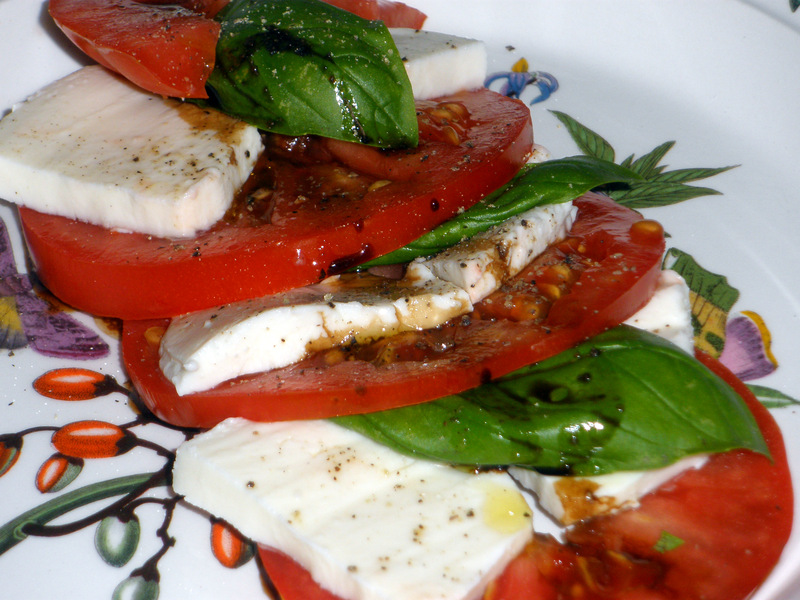 the first caprese salad of the spring is truly the best! love it. It was so good, I think I’ll have another one for lunch today. Sounds good….mint would work, too.